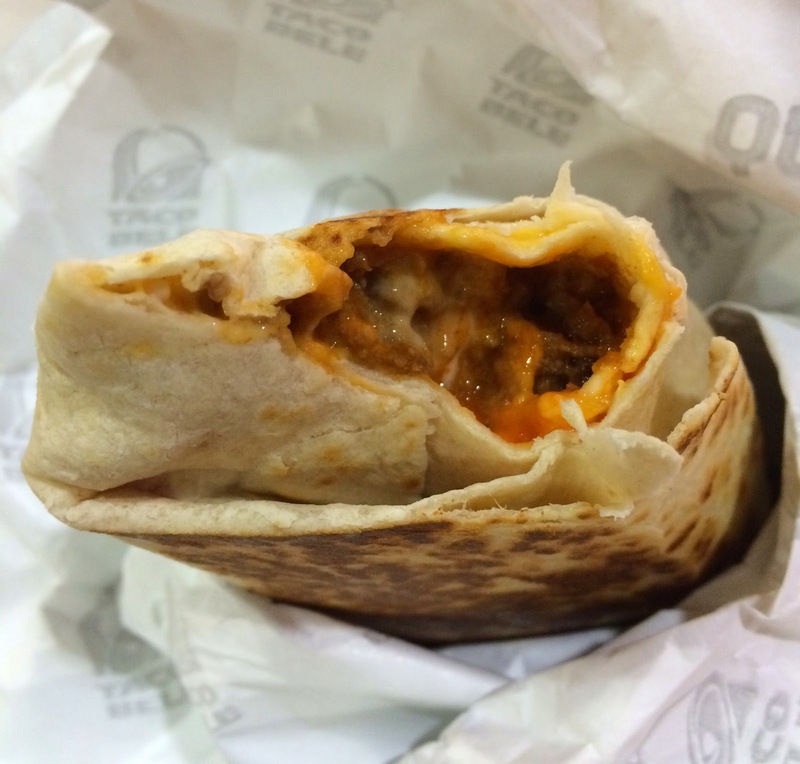 Today, February 26, 2015, Taco Bell launched new item called "Sriracha Quesarito." 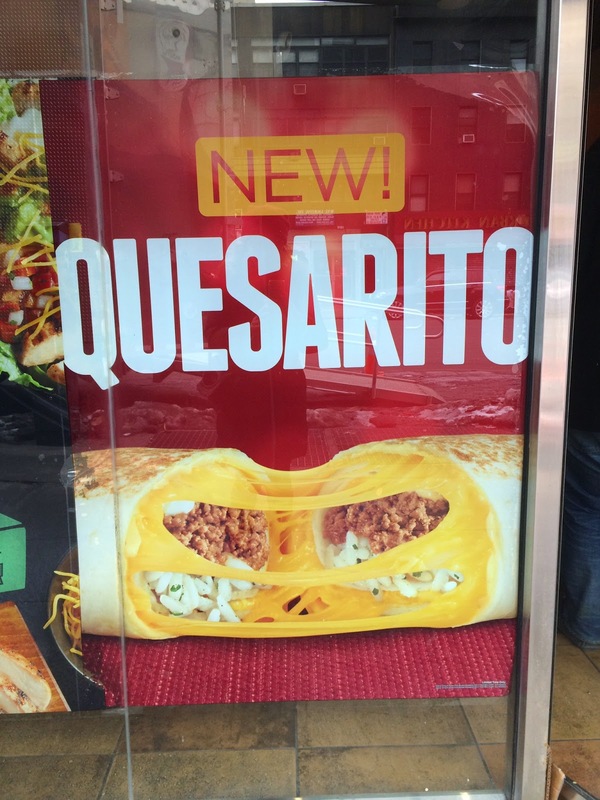 First Quesarito we tried was in July, 2014, when I was very sick (food poisoning from a business class food from an airline), but I really wanted to try as they said it's a limited time item, though they've been selling Quesaritos still. I went to a branch at Penn Station and waited in a line to order, but when my turn was up, they said they didn't have it and possibly would be available from the following day. To be honest, I sort of had expected it because those branches at Penn Station usually lack of new or limited items not applying only to Taco Bell but at least KFC, where they didn't have the Loaded Potato Bowl. In case of this "accident," I'd searched other close branches and I walked a couple of blocks down to go to an independent branch, not in a huge building. On the glass walls, there's a poster of Quesarito but it didn't indicate "Sriracha." I proceeded to the cash register and asked if they had the new Sriracha Quesarito though I didn't see any advertisement. Luckily they said yes and I ordered one with beef --- I didn't know I could choose the meat as the HP says beef only. I was telling the story of Penn Station's branch, then the presumed manager or owner said, "We have pretty much everything, and now you know where you can come to (get those)." In a minute or so, Sriracha Quesarito was ready. 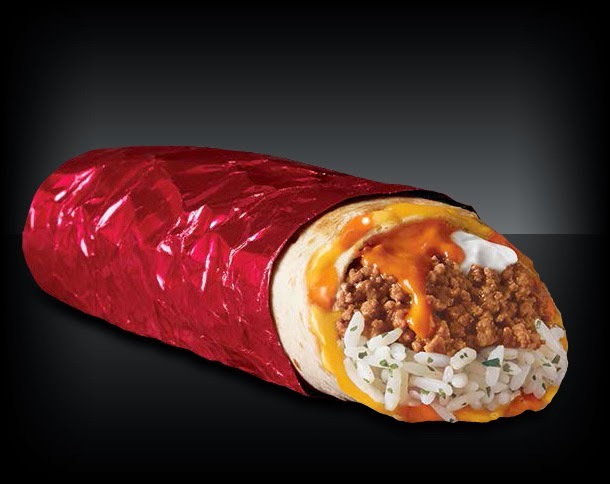 I thought it'd be wrapped in a shiny red foil like HP, but it's wrapped in a silver wrap with "Quesarito" and bells of Taco Bell in gray tones. 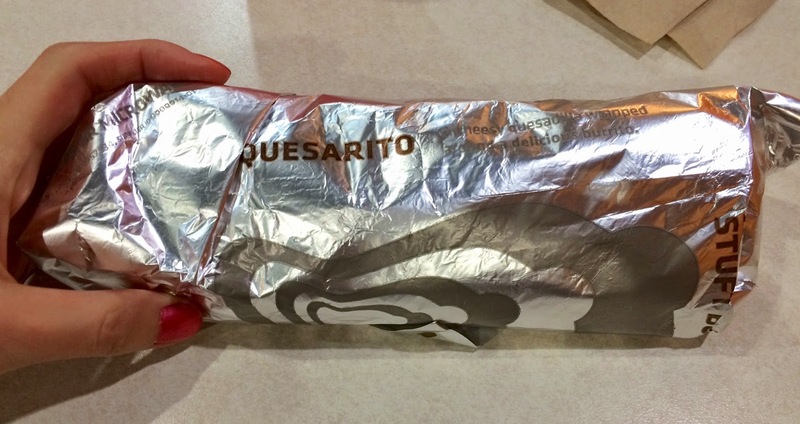 It's the darkest Quesarito and Burrito I bought so far. It didn't smell like Sriracha before eating, but from the first bite, I could taste Sriracha. It's the sour and tangy sauce I'm used to, and the more I ate, the spicier it got. Sriracha went well with the tortilla, ground beef and rice very well. 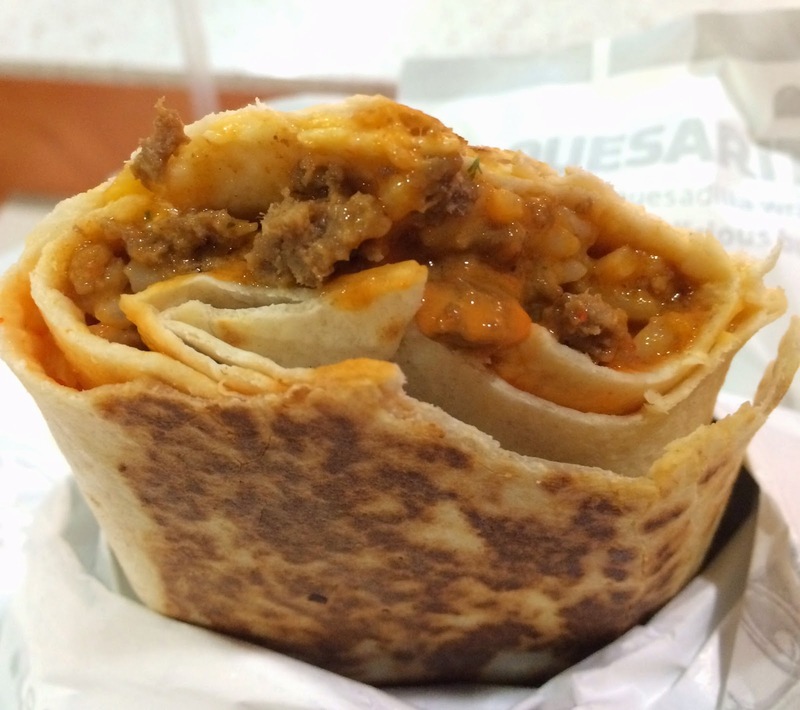 Actually, the cheese between quesadilla wasn't only melted cheese but also contained Sriracha. On the HP, it says they use seasoned beef, premium Latin rice, and reduced-fat sour cream, but Sriracha had such a strong flavor, I didn't taste any seasonings in the beef or sour cream. 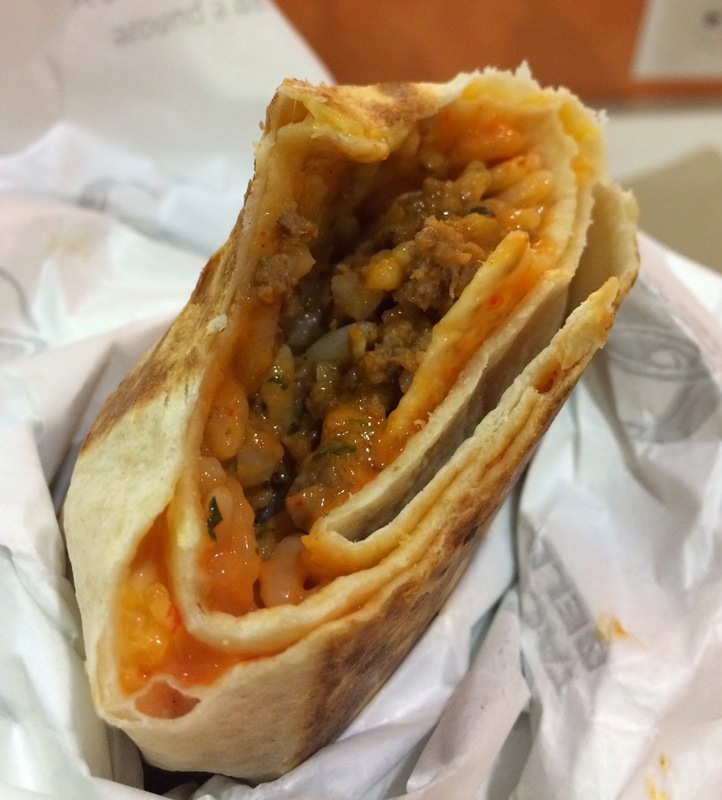 I feel like this Sriracha Quesarito showed Sriracha never goes wrong with anything, and the melted gooey cheese helps to reduce some heat a little bit, but I kept tasting the spicy Sriracha while eating. 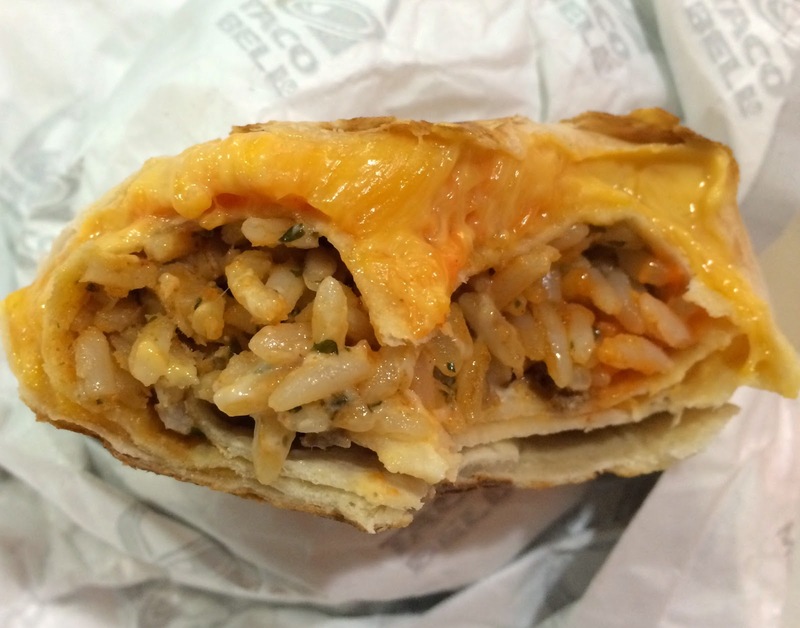 Thanks to the sourness besides the heat, Quesarito tasted slightly less heavy. If you like spicy food, quesadilla and burrito, I highly recommend this. * HP says it's a limited time item at participating locations only.